Patrick is a primary school teacher from Ballincollig, and has won three Mid-Cork U21 titles, one County Minor medal, three Munster U21s and an Inter-provincial title, along with his 2010 All-Ireland medal. He made his Senior debut against Meath in the 2008 National League, and first played football with Westside in U9 Parish Leagues. 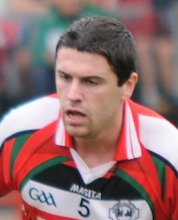 He also likes hurling, table tennis and soccer, and his best football memory is beating Kerry in U21 in 2004. He considers Fergal Keohane to be the best player he has ever seen, and thinks that the GAA is the best invention ever. He would like to meet Barack Obama, and marooned on a desert island, could not be without his mobile phone.